Prepare grill for two-zone cooking, placing pre-heated charcoal briquets on one half of the grill’s charcoal grate to create a hot and a cool zone. Add 1–2 chunks of your favorite smoking wood to the preheated Kingsford® charcoal briquets then replace the main cooking grate. Adjust the grills bottom vents to bring the temperature to approximately 300°F. Set the peanuts in a vegetable grilling basket and set the basket on the cool side of the grill. Cover the grill and allow the peanuts to smoke for approximately 30 minutes until golden brown. Add the smoked peanuts, peanut oil, honey and salt to a food processor or blender and purée until smooth. Set the smoked peanut butter aside until ready to use. 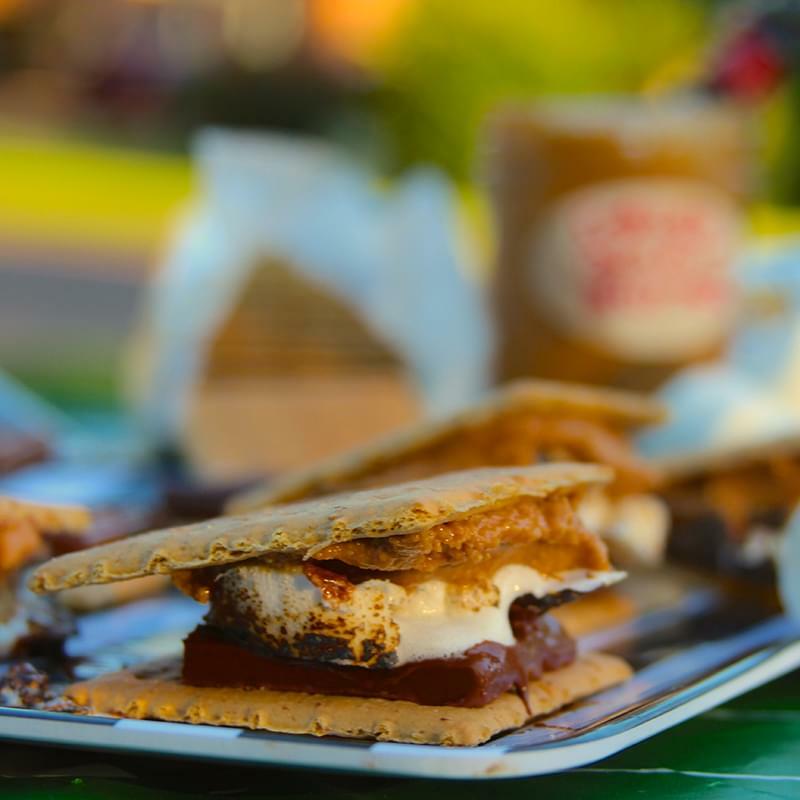 Prepare the s’mores by spreading a layer of smoked peanut butter on eight of the graham cracker squares then adding a chocolate square to each of the remaining graham crackers. Remove the main cooking grate from the grill. Skewer marshmallows with a long stick then toast the marshmallows over the hot charcoal briquets until golden brown. Place the toasted marshmallows on the chocolate, top with the peanut butter graham cracker squares then gently press together. Eat immediately.